If you've spent much time around bodies of water like rivers, streams, ponds or marshes, and if you've looked closely at your surroundings, you might have seen small amphibians known as tadpoles in the water. These creatures are in the midst of developing into fully grown frogs and toads from frog and toad eggs that the mother lays in the water and the father fertilizes. Fascinating facts about tadpoles make them interesting to observe. Sometimes, toads' tadpoles are called toadpoles. As far as taxonomy, frogs and toads belong to the class Amphibia and order Anura. The three Anura suborders are Archaeobatrachia, Mesobatrachia and Neobatrachia. True frogs are part of the family Ranidae, and true toads are members of the family Bufonidae. At least 5,000 frog and toad species are known to exist in the world. These amphibians differ in certain characteristics, such as size, color and shape. Tadpoles do not resemble frogs or toads much at all -- they look more like fish, in terms of the shapes of their bodies and their long, finlike tails. Frog and toad tadpoles tend to be earthy in color, such as brown, gold and green shades. Their bodies display markings such as spots and speckles. Frog and toad tadpoles have two to four rows of teeth, depending on species. A tadpole has a tail, but when it's changing into a froglet and getting rid of its tail, it stops eating and absorbs into its body all the food that's been stored in the tail. 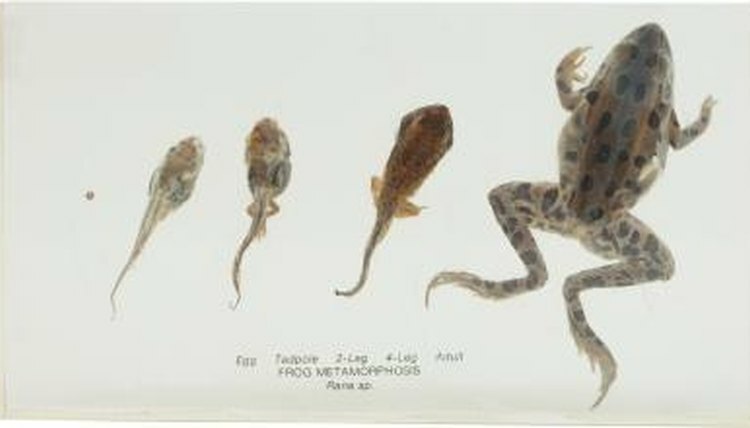 Frog tadpoles eventually transform into frogs, and toad tadpoles morph into toads. The time it takes for this transformation to complete varies widely from species to species -- some amphibians fully develop into frogs or toads within six weeks, whereas others take up to three years to complete the process. Ideally, the transformation should take place in the wild outdoors,rather than in captivity, especially given that numbers of amphibians have been decreasing in the wild. Frog and toad tadpoles have what they need in the wild to develop properly. Because tadpoles are so sensitive, the water they live in cannot contain certain toxins and chemicals, such as chlorine, heavy metals and chloramines. Tadpoles breathe and absorb oxygen when they are in the water, whereas fully developed frogs and toads can breathe on both land and water. Tadpoles breathe through gills, which is another characteristic that makes them similar to fish. As they grow, they eventually lose their gills. Not only do tadpoles look somewhat like fish, they also behave like them. They swim around in schools in the bodies of water they inhabit while developing. Tadpoles start to eat plants, such as algae and seaweed, about a week after they hatch from eggs. Eventually as they grow, they start to eat insects. They spend all of their time as tadpoles living in water. Once tadpoles become fully grown frogs and toads, they live both in water and on land. Maryland Zoo: Frogs and Toads - Do You Know the Difference?